Persian Monarch Reza Shah Pahlavi came to power in 1925, but he was forced to abdicate under Allied pressure in 1941. He died in exile in 1944 and his remains were returned to Iran in 1950. Has a symbol of Iran's pre-revolutionary past come back to haunt it? Speculation that a body found near a former mausoleum south of the Iranian capital might be that of Reza Shah, the founder of the Pahlavi Dynasty who once strived to modernize the former Persia, has stoked Iranian interest in their country's pre-revolutionary and pre-Islamic past. It has also prompted a warning for Iranian authorities from Reza Shah's grandson, Crown Prince Reza Pahlavi, who has campaigned against Iran's clerically dominated political establishment from his exile in the United States. Reza Pahlavi tweeted that he was watching the news "closely" and cautioned Iranian leaders against any "cover-up" or "lack of transparency." The mummified body was found at the former site of Reza Shah's tomb, which was destroyed following Iran's Islamic revolution in 1979 in one of the first in a long line of official and semiofficial actions to distance the country from its royal past. The head of the Tehran council's cultural heritage and tourism committee, Hassan Khalilabadi, was quoted by government news agency IRNA, conceding that it was "possible" the gauze-wrapped body found at the site belonged to Reza Shah Pahlavi. "Some believe it is possible that the body belongs to the first Pahlavi that was transferred to Tehran after being mummified and buried in the shrine of Abdol Azim Haasani," he said on April 23. But the head of the public-relations office of the shrine was quoted by local media as dismissing the reports about the body as "rumors" created on social media. "The area surrounding the shrine was previously a cemetery, so discovering a body in this area is natural," the semiofficial ISNA news agency quoted Mostafa Ajorlou as saying. Khalilabadi said that it would be up to heritage experts and physicians to determine the identity of the body. He said that regardless of whose remains they were, they have a "heritage aspect" and should be preserved. The statements have set the rumor mill spinning. On social media, some people circulated a photo of Reza Shah's body next to the mummified body to claim -- ostensibly based on clues like the position of the hand and the face -- that they could be one and the same. Many used the hashtags #Rezashah, #Mummy_of_Reza_Shah and #Where_is_the_mummy alongside pleas for the body to be preserved and for authorities to take good care of it. "#The_Mummmy_of_Reza_Shah is historic heritage and it belongs to all the people and the future [generations]. It should be preserved," Abbas Khansari tweeted, noting in a separate tweet that the remains "can bring many tourists." Others suggested that the Iranian clerical establishment still fears Reza Shah, who is seen by many as having brought progress and prosperity to the country, and they echoed Reza Pahlavi's suggestion that Iranian officials might attempt to cover up the identity of the mummified body. "Even his dead body scares the heck out of the Ayatollahs," user Shahriar Ershadi wrote on Twitter. Mummified body of the late Reza Shah Pahlavi (1887-1944) Shah of Iran (1925-1941) and the father of secular Iran, found south of Tehran. "You were so mighty and strong that they even fear your mummy," another user tweeted. Reza Shah, who was forced to abdicate under Allied pressure during World War II, died in South African exile in 1944. His remains were flown back to Iran in 1950 and buried in a mausoleum in Ray, south of Tehran. Reza Shah's huge tomb was destroyed in 1980 by a crowd that was said to have been led by Sadegh Khalakhali, who had been appointed by the founder of the Islamic republic, Ayatollah Ruhollah Khomeini, as the head of the revolutionary courts. Khalkhali, nicknamed the "hanging judge" for ordering hundreds of summary executions, wrote in memoirs published in 2000 that it took 20 days to destroy the tomb due to its sturdy construction. "We were forced to use dynamite to gradually destroy the mausoleum," he wrote. 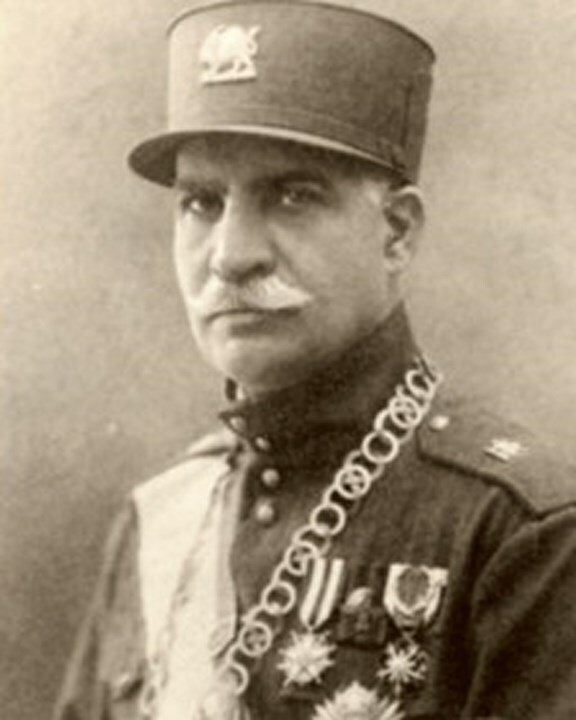 Khalkhali said that revolutionaries were unable to find Reza Shah's remains, claiming that his son, Mohammad Reza Shah Pahlavi, had taken his father's "bones" with him when he left Tehran for Cairo shortly before the revolution. That claim was later denied by the Shah's wife, Farah Diba, according to RFE/RL's Radio Farda. Reza Pahlavi's media office also told RFE/RL in an email that the body of Reza Shah was never removed from Iran "as rumored by the regime and its proxies." "It was left at his mausoleum where he was buried," the email said. Many Iranians are nostalgic about their pre-revolutionary past, including young Iranians who were born after the 1979 revolution and the creation of the Islamic republic. During anti-establishment protests that took place in dozens of cities across the country in December and January, some chanted slogans in support of the Pahlavi Dynasty, including: "Reza Shah, may your soul be blessed!" "Reza Shah, apologies, apologies!" and "What a mistake we made by taking part in the revolution." "I'm not superstitious, but it's interesting for me that the mummy of Reza Shah was found after the 'Reza Shah, may your soul be blessed' chants," a user wrote on Twitter, adding that it was as if Reza Shah had come to watch the fate of the Iranian nation.